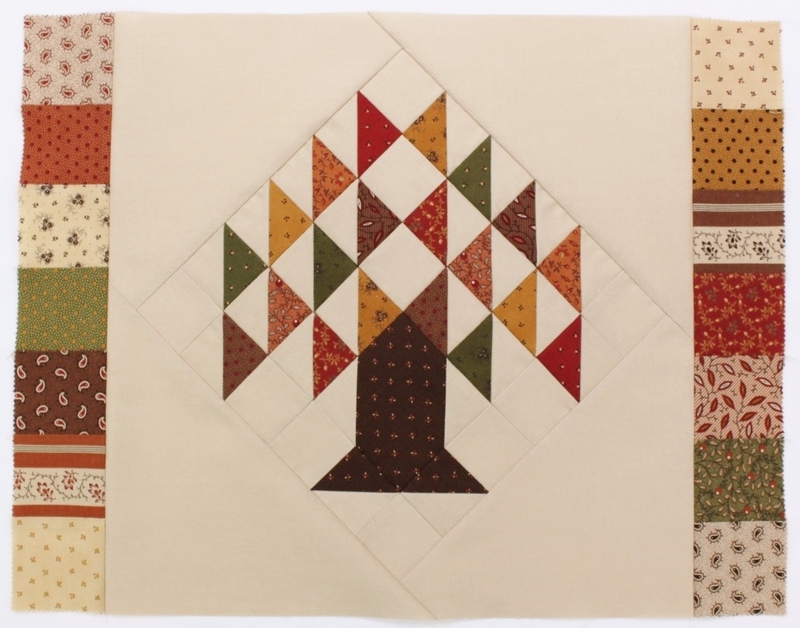 Before you begin, take a few minutes to decide which mini charm squares you’d like to use for the tree leaves and which you’d like to use for the pieced border. You’ll need 10 mini charm squares for the leaves and 32 for the border. 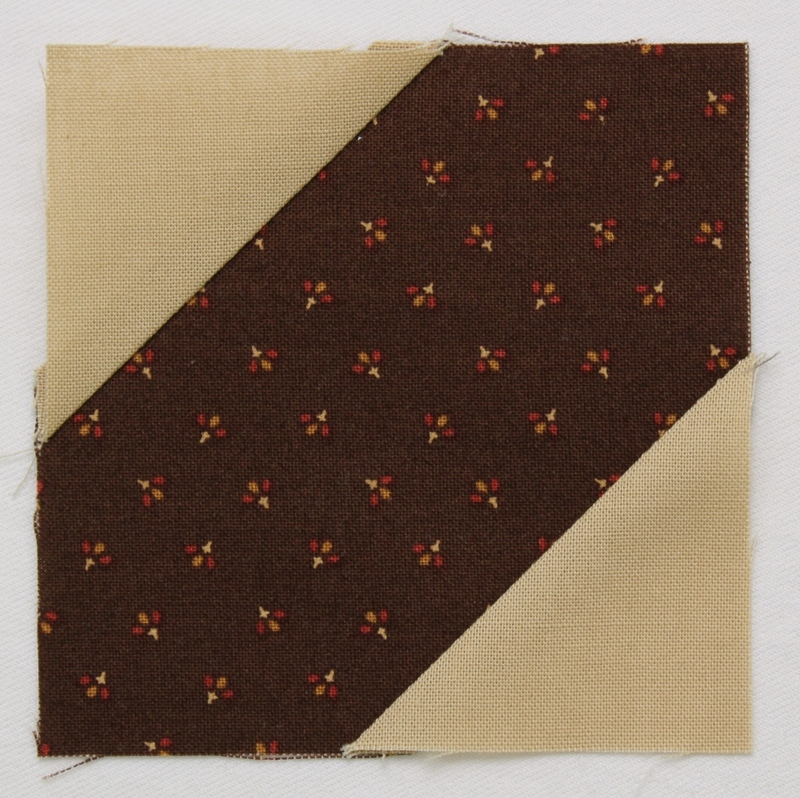 On the wrong side of each of the 11 background fabric 2½” squares, lightly draw a diagonal line from corner to corner. 2. Layer a marked background fabric 2½” square atop one of the mini charm squares that you chose for the leaves with right sides together. 3. Stitch the pair together a scant ¼” from either side of the drawn line. Press to set seams. 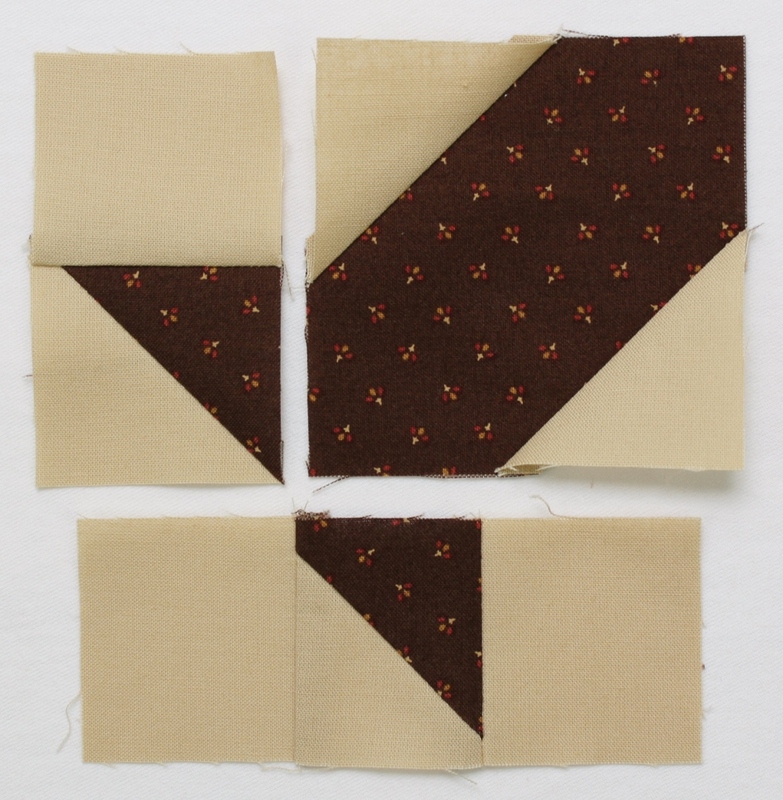 Cut the pair apart on the drawn line to make 2 half-square triangle units. 4. 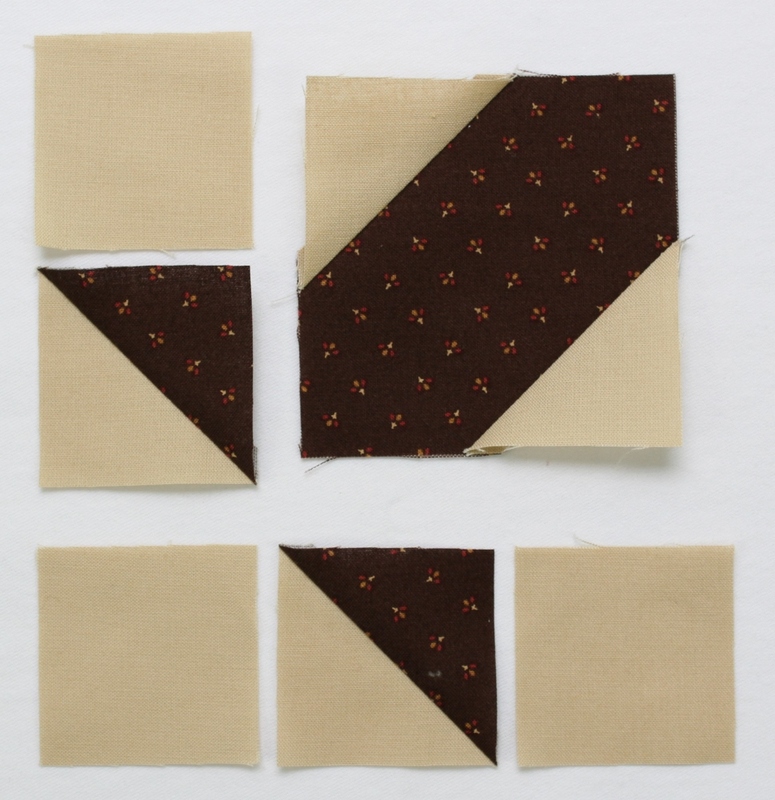 Press the seam allowances away from the background fabric and trim the half-square triangles to measure 2″ x 2″. It helps to use a ruler with a 45° line on it. Before trimming, make sure that the 45° line runs along the diagonal seam of the half-square triangle unit. Trim the right and top edges of the unit, then flip 180° and trim the two remaining edges in the same manner. 5. 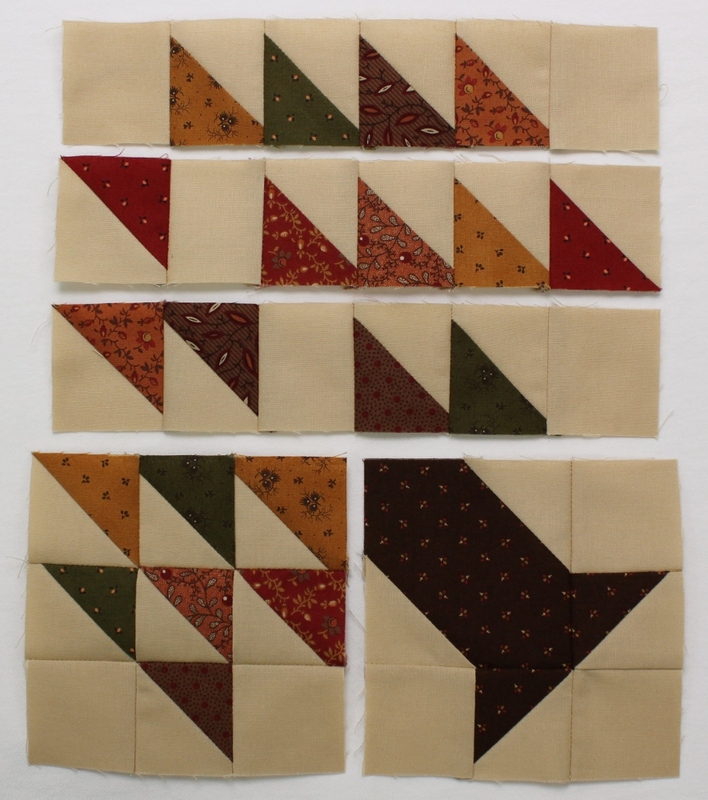 Repeat with the remaining mini charm squares chosen for leaves to make 20—2″ x 2″ half-square triangles (“HSTs”. 6. 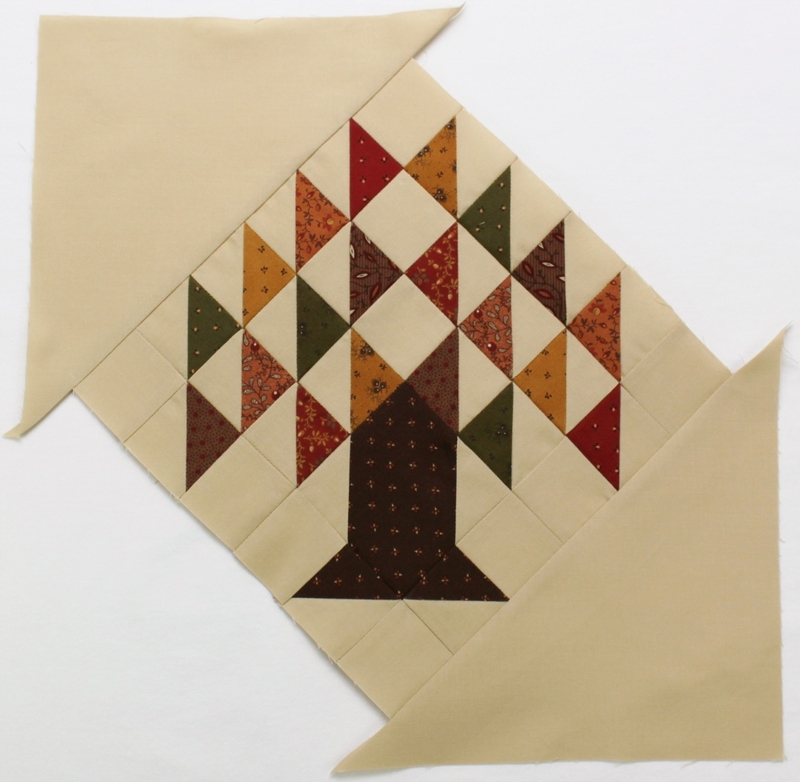 Repeat steps 2-4 with the remaining 2½” background square and the tree trunk print 2½” square to yield 2 tree trunk print 2″ x 2″ HSTs. On the wrong side of 2 background 2″ squares, lightly draw a diagonal line from corner to corner. 2. 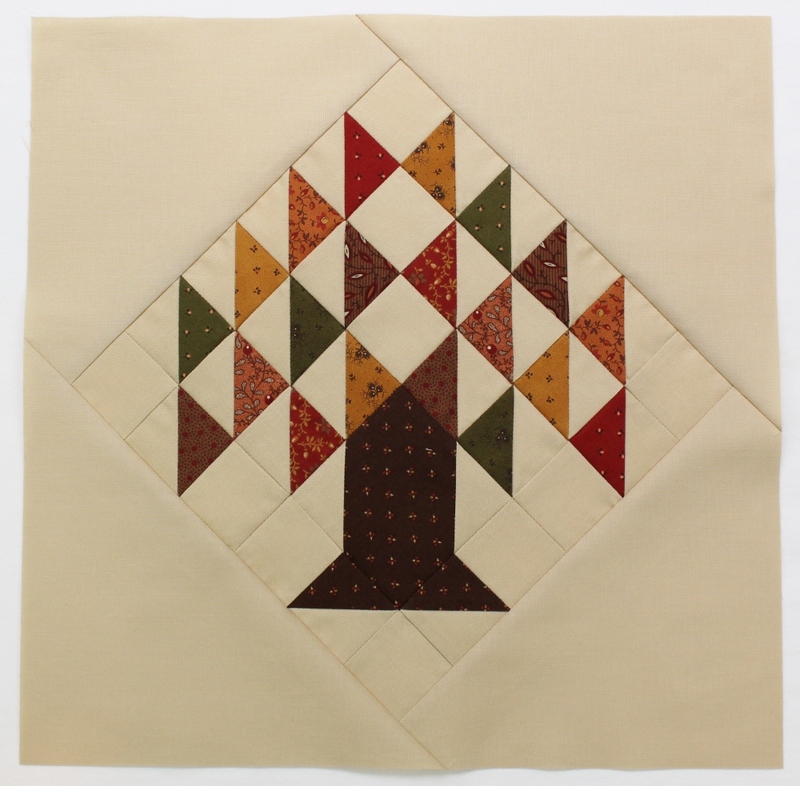 Layer a marked 2″ square atop one corner of the tree trunk print 3½” square with right sides together. 3. Stitch the pair together on the drawn line. 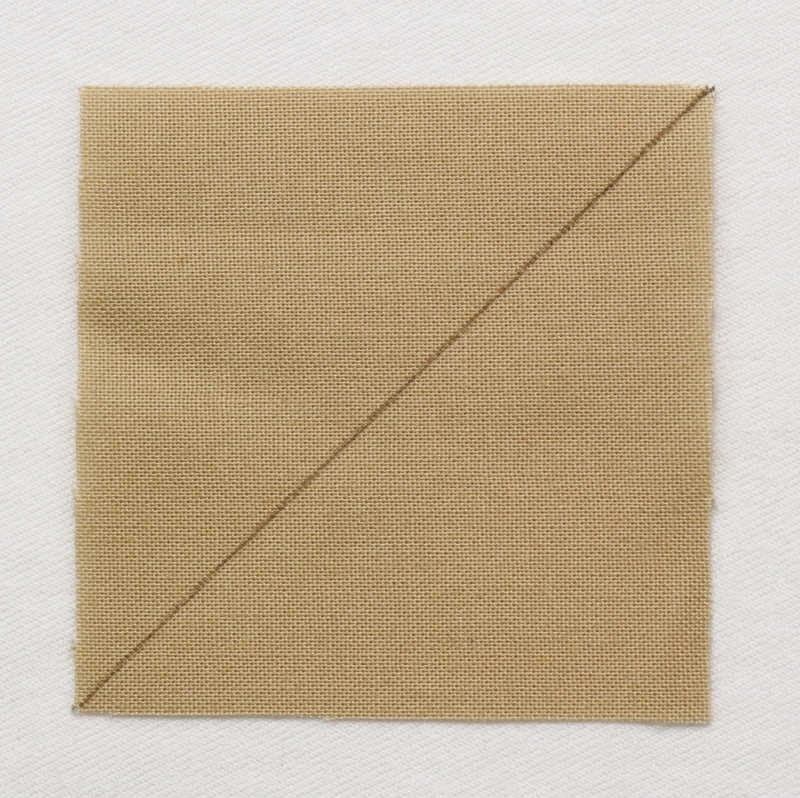 Trim the seam allowance to ¼”. 4. Press toward the background square. 5. Repeat steps 2-4 with the opposite corner to make the main trunk unit. 6. 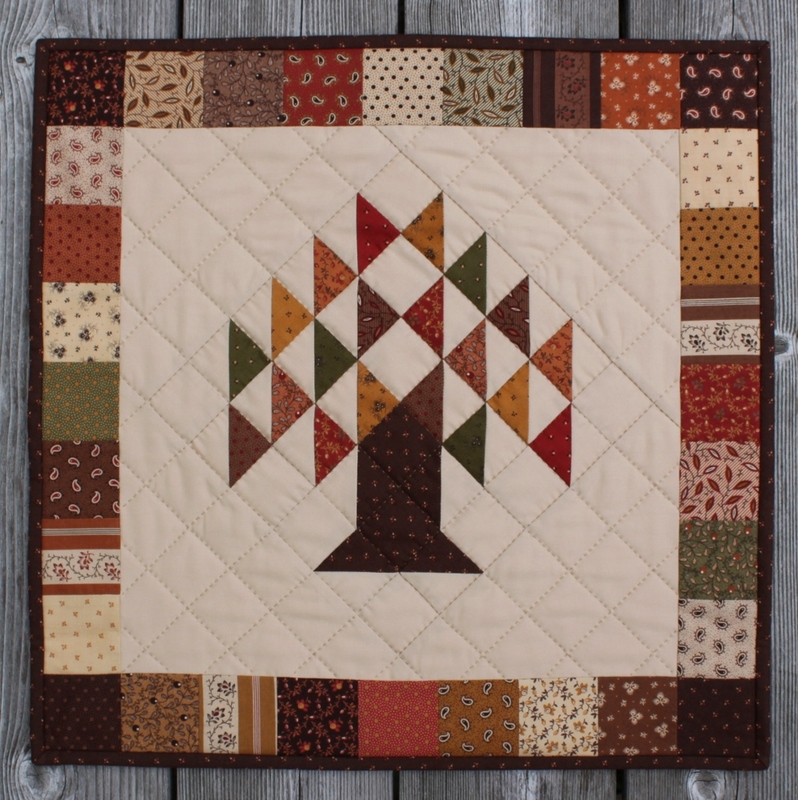 Gather the main trunk unit (step 5), 2 tree trunk print HSTs, and 3 background 2″ squares. Lay out in rows as shown below. 7. Join together the background square and HST to the left of the main trunk unit. Press seam allowances away from the HST. 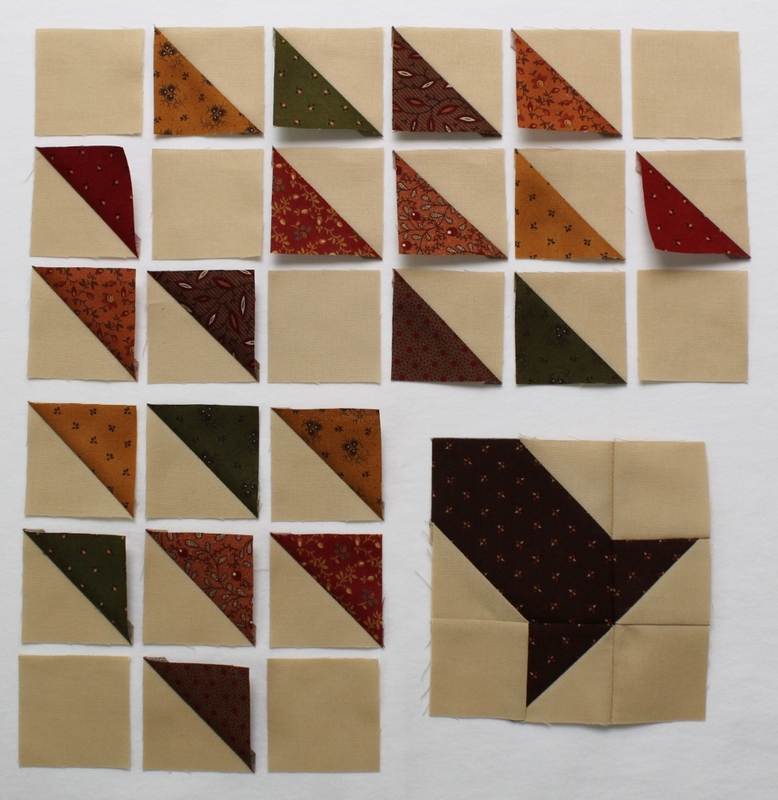 Sew a background square to the left and right sides of the HST below the unit from step 5. Press seam allowances toward the HST. 8. Join together the pieces in the top row. Press seam allowances away from the main trunk unit. 9. Join the bottom row to the bottom edge of the unit from step 8. Press the seam allowances open. 2. Join together the pieces in each of the 3 rows to the left of the tree trunk unit. 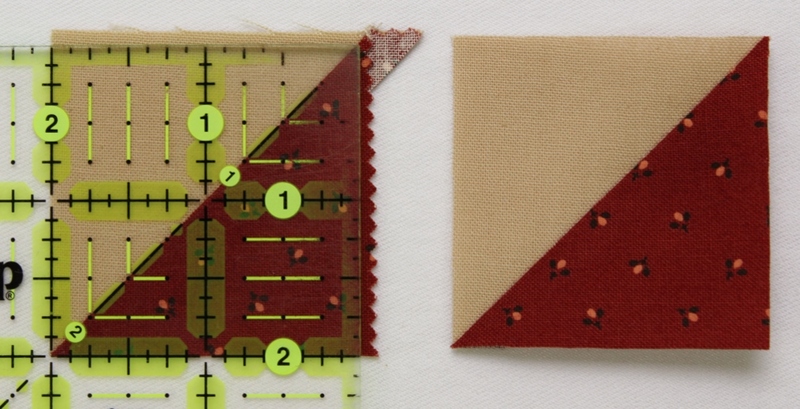 Press seam allowances in one direction, alternating direction in each row. 3. Join together the 3 rows to the left of the tree trunk unit. Press seam allowances open. 4. Join together the pieces in each of the 3 top rows. 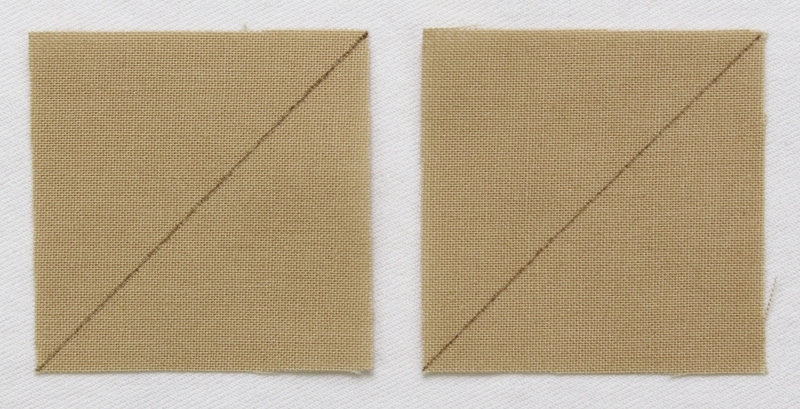 Press seam allowances in one direction, alternating direction in each row. 5. Join together the top 3 rows. Press seam allowances open. 6. Join together bottom left group of HST rows and tree trunk unit. Press seam allowances open. 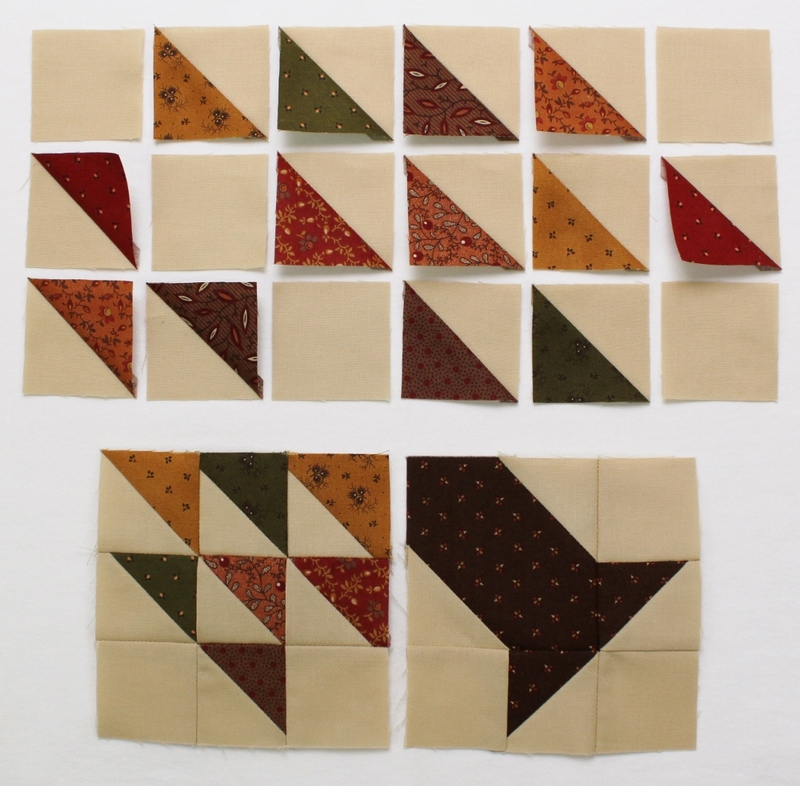 Then join together the top group of HST rows and bottom unit to complete the block. Matching centers, sew setting triangle to opposite sides of the center block. Press seam allowances toward the setting triangles. 2. Trim the setting triangles even with the center block. 3. 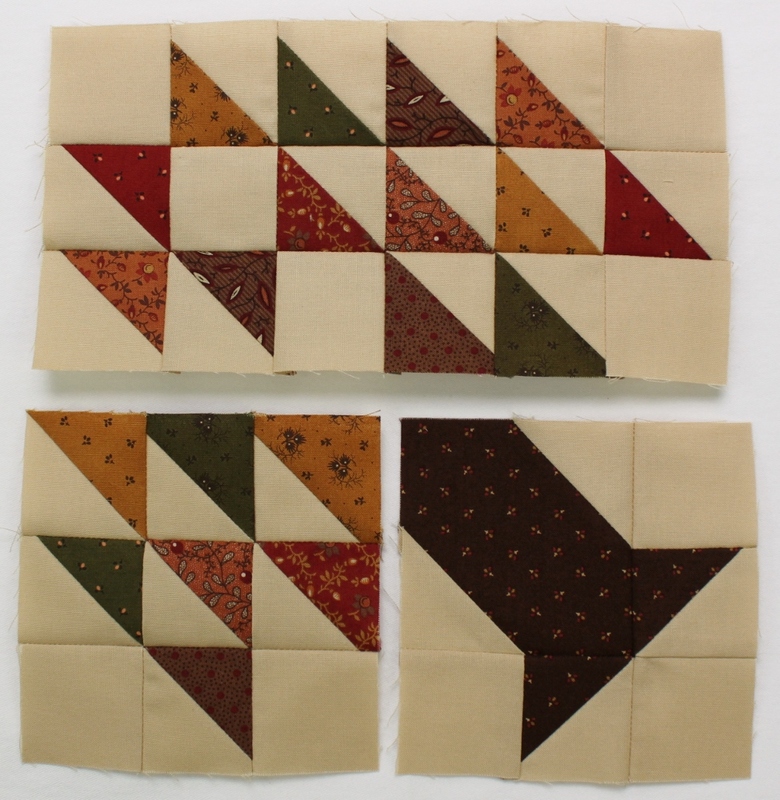 Matching centers, sew setting triangles to remaining opposite edges of the center block. Press seam allowances toward the setting triangles. 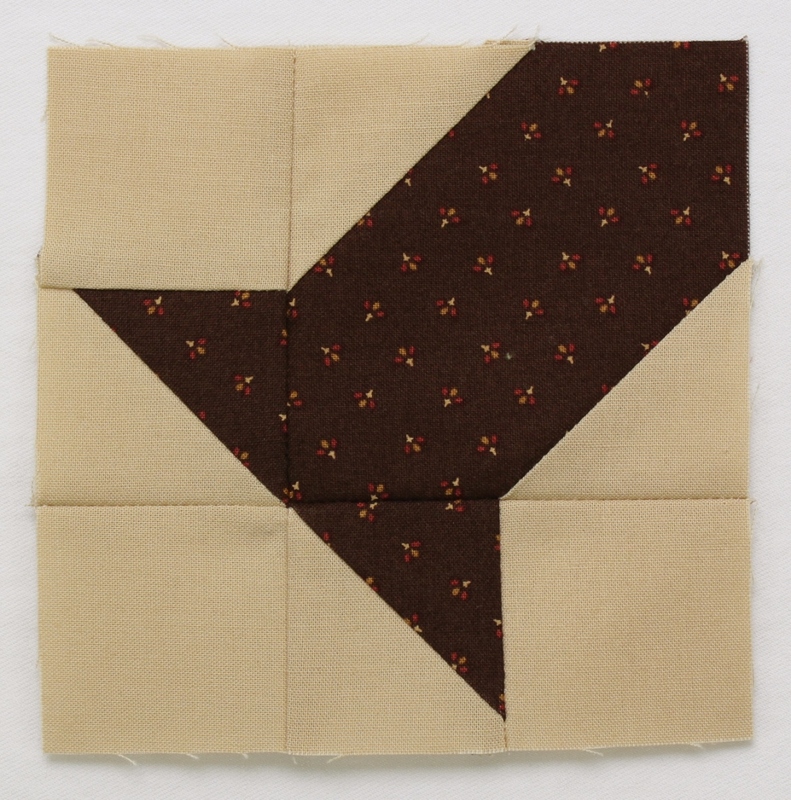 Trim quilt center to measure 14½” x 14½. 4. Lay out 2 rows of 7 mini charm squares each and 2 rows of 9 mini charm squares each. 5. Join together the pieces in each row. Press seam allowances open. 6. 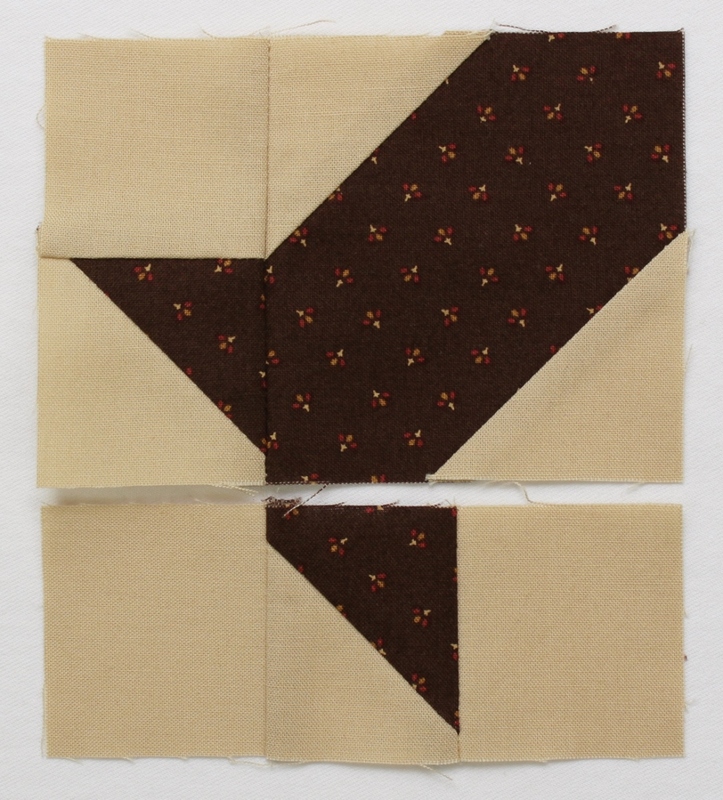 Sew a short border strip to the left and right sides of the quilt center, pressing seam allowances toward the pieced border. 7. 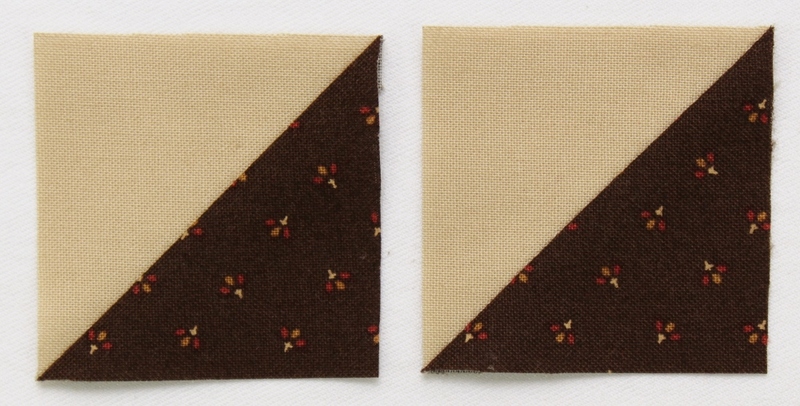 Sew a long border strip to the top and bottom of the quilt center, pressing seam allowances toward the pieced border. Layer the quilt top with batting and backing fabric. Baste, quilt as desired and bind. I hand quilted my project in a 1½” cross-hatch pattern. 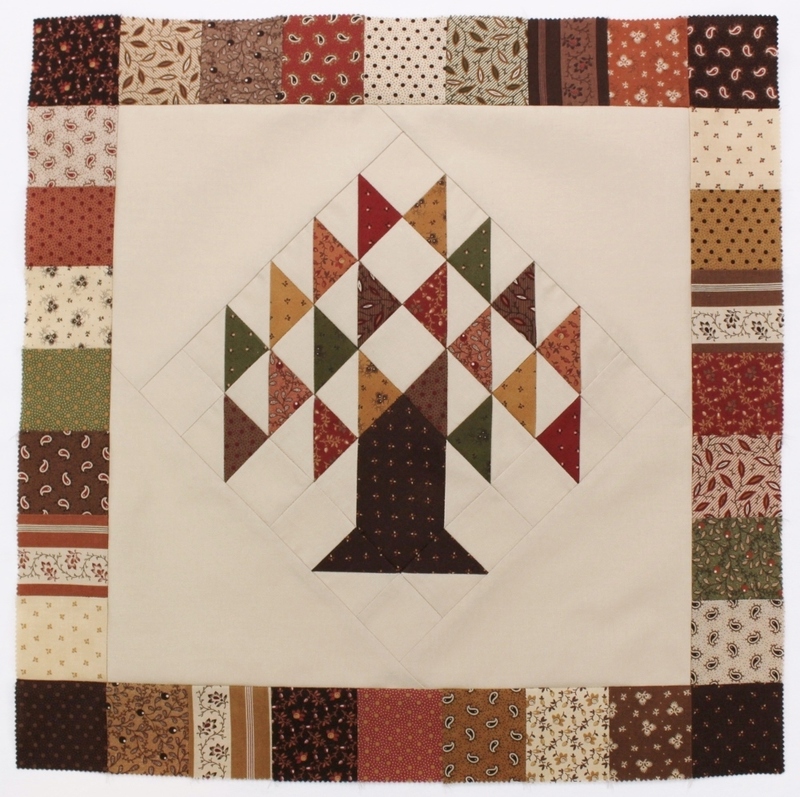 Layer the quilt top with batting and 22″ x 22″ panel of lining fabric. Baste and quilt as desired. 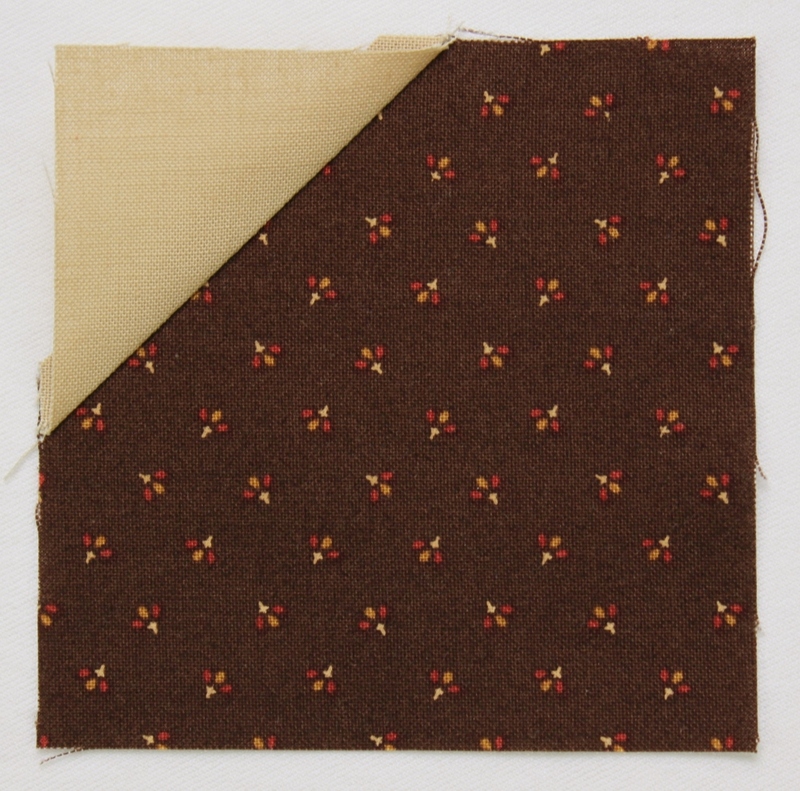 From the backing fabric, cut 2 panels 14″ x 18½”. 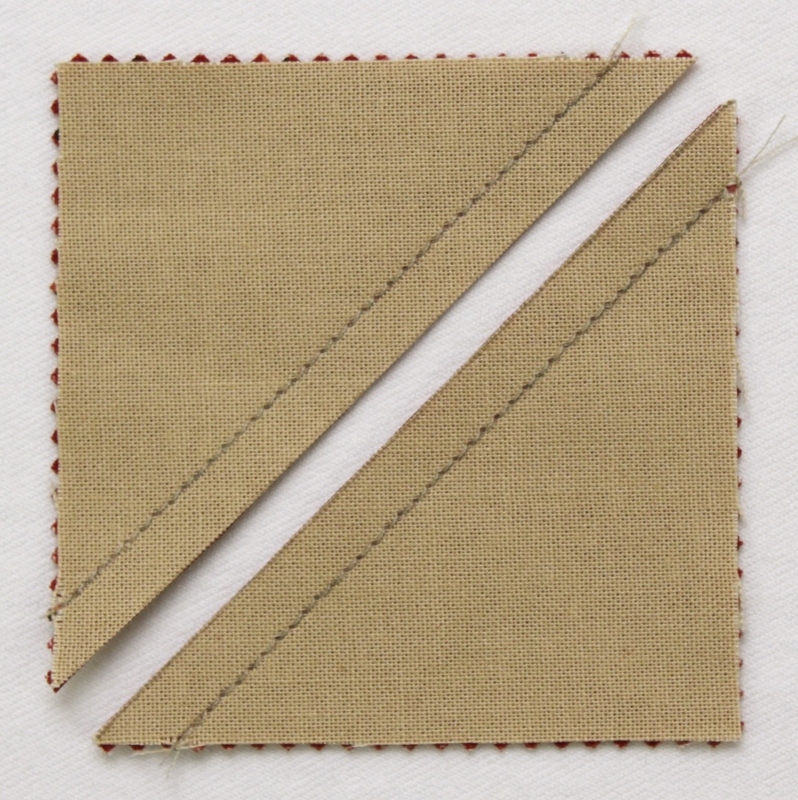 Fold one long edge of a backing panel toward the wrong side 1/2″ twice and press to form a hem. Stitch hem close to the fold. Repeat steps 2-4 to hem the second backing panel. Lay quilted pillow top face down on a flat surface. Layer a backing panel on the back of the quilted pillow top with wrong sides together and raw edges aligned. Layer the remaining backing panel on the opposite edge of the pillow top with wrong sides together and raw edges aligned. Pin to secure layers and machine baste 1/8″ from all raw edges. 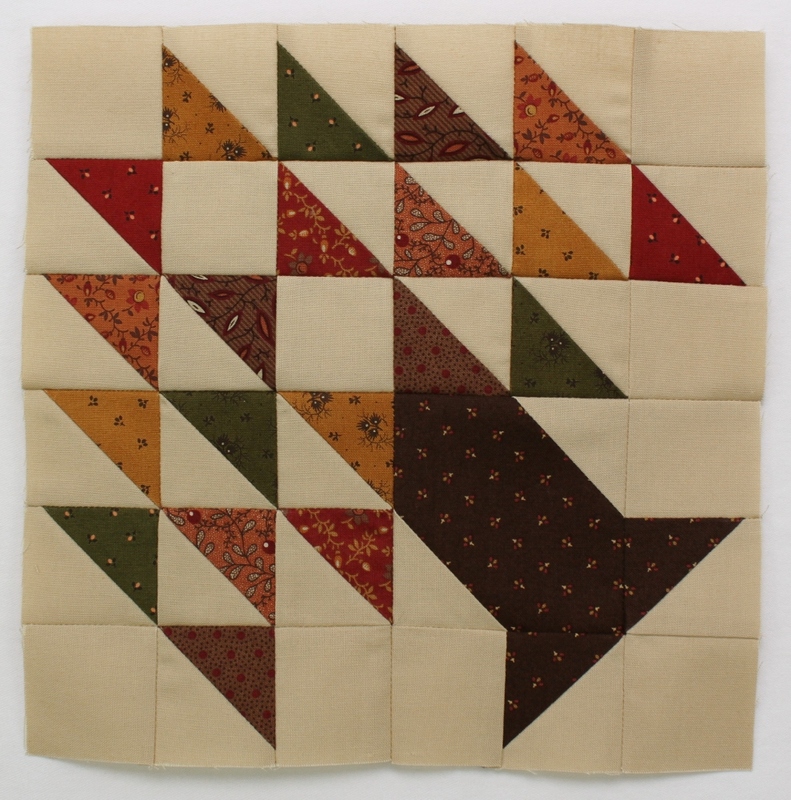 One 18½” square mini quilt or pillow—your choice! By the way, I love this new technique of using overlapping backing panels and binding the quilt as usual. 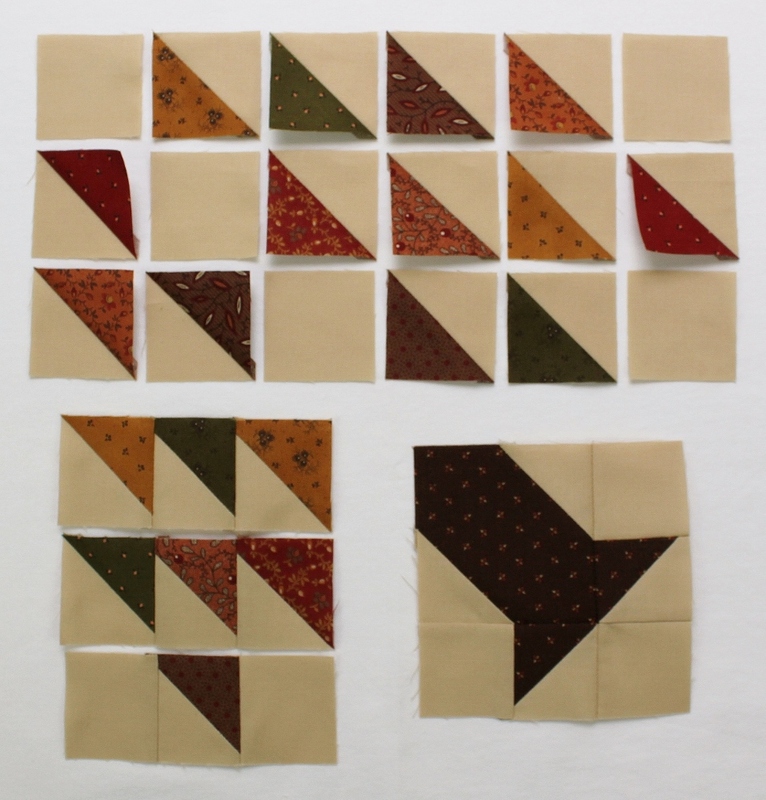 The binding reads as piping when the project is used as a pillow, but if you want to use it as a mini quilt, you have only to remove the pillow form and give it a quick press. Brilliant!! Thanks so much for following along with this tutorial. 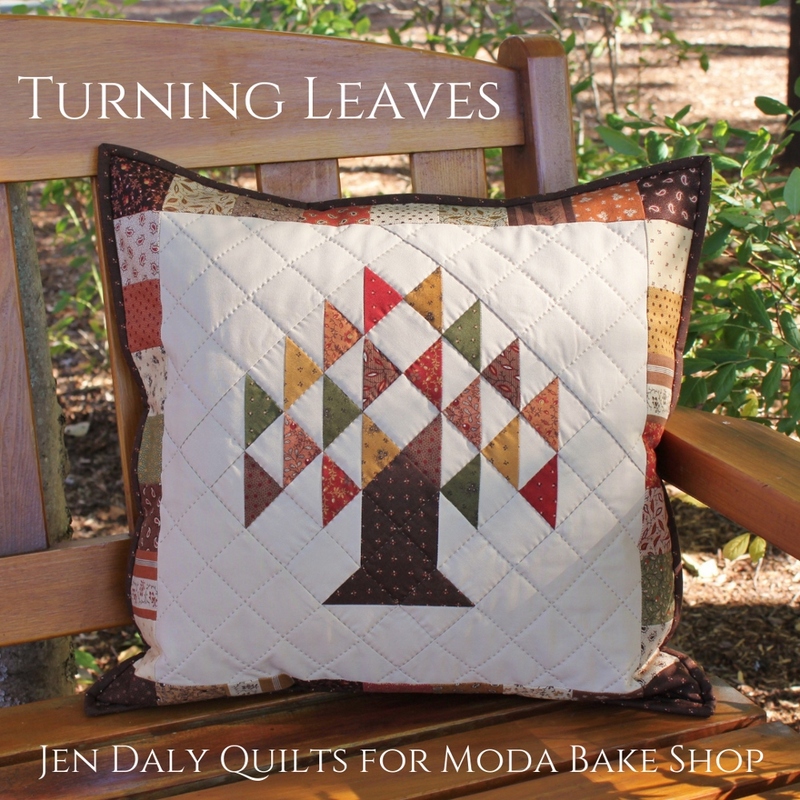 If you share your quilts on Instagram or Facebook, please tag me @JenDalyQuilts—I’d love to see what you make! 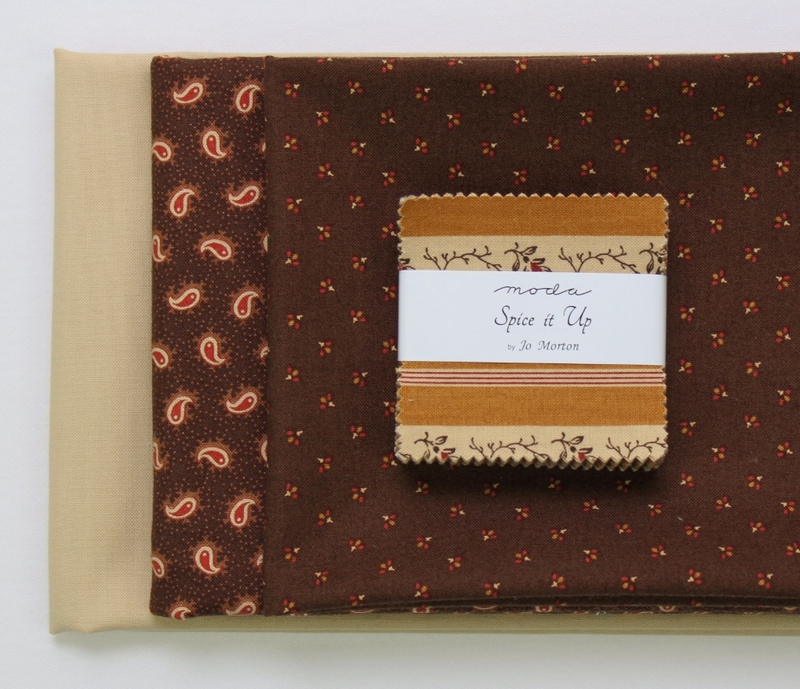 This entry was posted in Easy, Home Decor, Moda Candy/Mini Charms/Petit Fours, Quilt, Seasonal and tagged Fall, Jen Daly Quilts, Spice It Up. I made this pattern back in the days where you used TEMPLATES making separate triangles. Thanks for making this great pattern easier for all to use. This is a lovely pillow! Your tutorial looks very thorough. Thank so much! I’m glad you like it! What a great pattern. I love the feel of New England and the season we are in right now. Can’t wait to try this. Yay! I hope you have fun making this project! Happy fall!! Thank you! A beautiful pillow and pattern! I know the objective here is to promote use of products as packaged but I don’t want to buy a mini charm pack, I just want to buy the collection of colors to make this. Do you have measurement equivalents for this “recipe”? 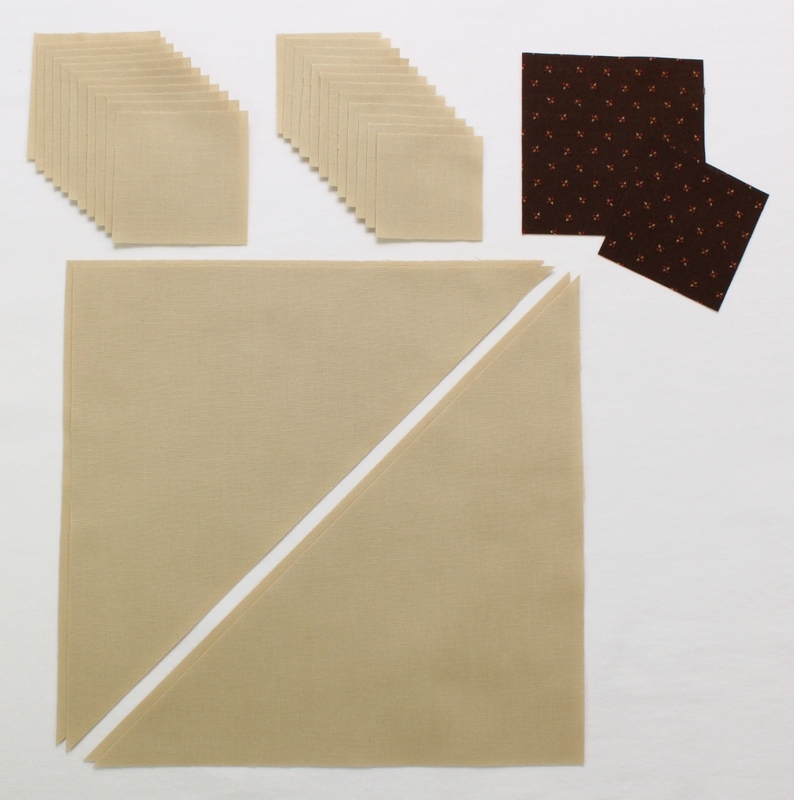 1) You can substitute 42 – 2 1/2″ x 2 1/2″ squares of your own choosing from your stash for the mini charm pack. 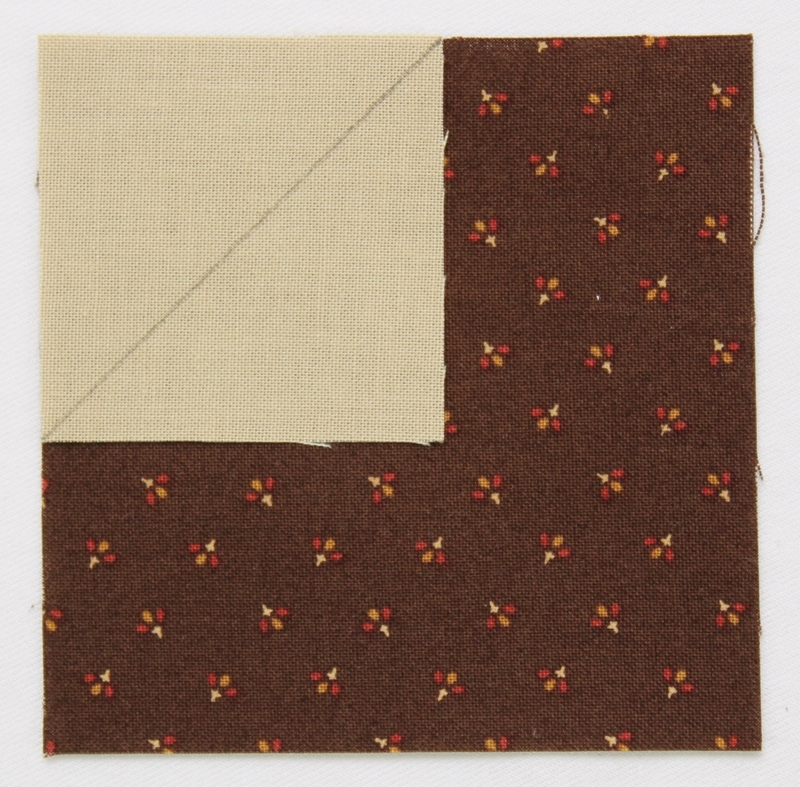 2) You could use 10 – 2 1/2″ x 2 1/2″ squares for the leaves and a ¼ yard of fabric for the outer border if you don’t want it to be pieced. 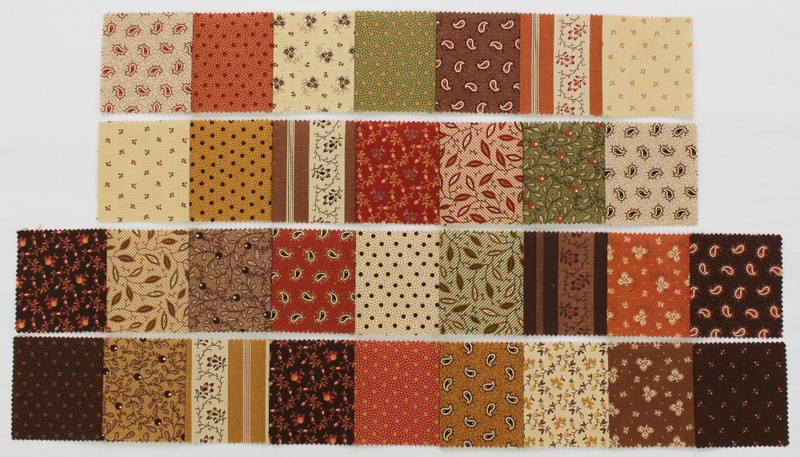 The border strip cuts would then be: 2 border strips 2 1/2″ x 18 1/2″ and 2 border strips 2 1/2″ x 14 1/2″. 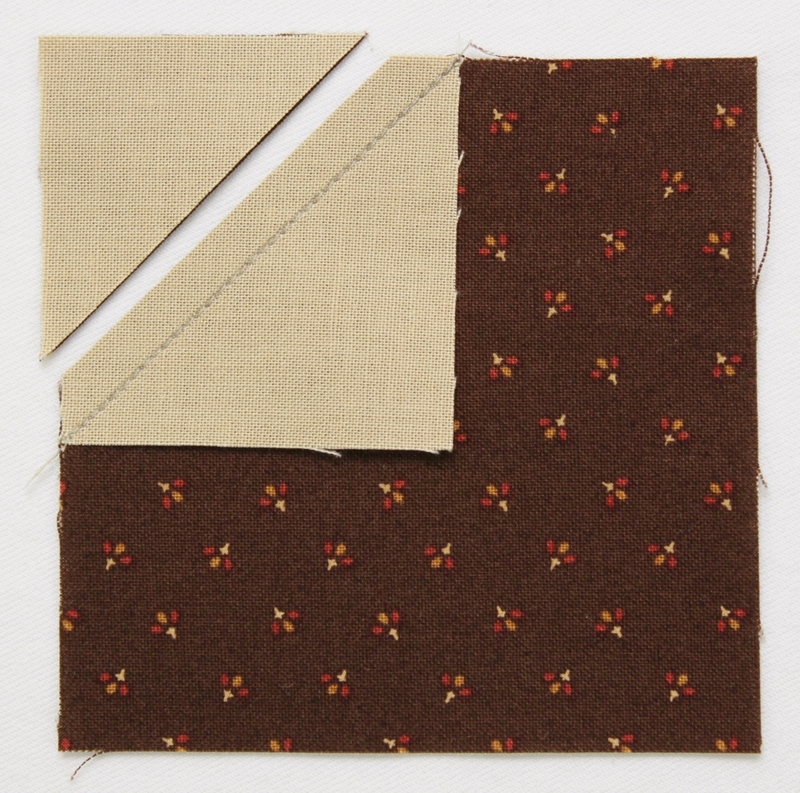 3) If you want to use the same fabric for all of the leaves and the outer borders, you’d need ¼ yard (then just cut the 10 – 2½” squares and the borders strips as listed above). 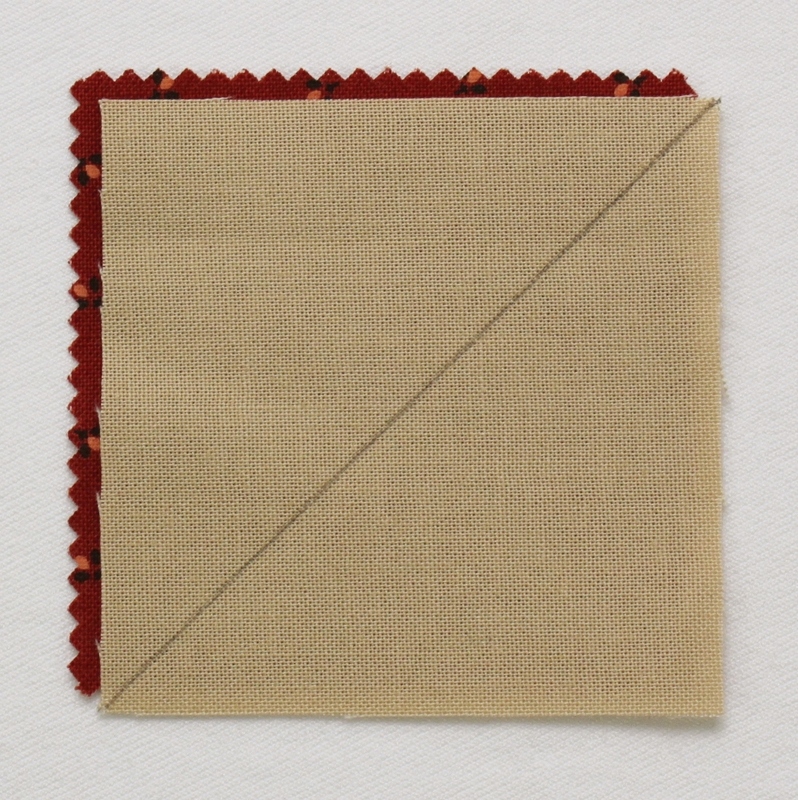 For the above three options, the yardage remains the same for the background fabric (1/3 yard), the binding and tree trunk fabric (1/4 yard), and the backing (2/3 yard). I love this! You are so talented and thanks so much for sharing! Thank you, Marsha! I’m so happy you like the project! What a beautiful pillow! I love that pattern. Would be awesome in Christmas fabric too. Thank you! What a fantastic idea! 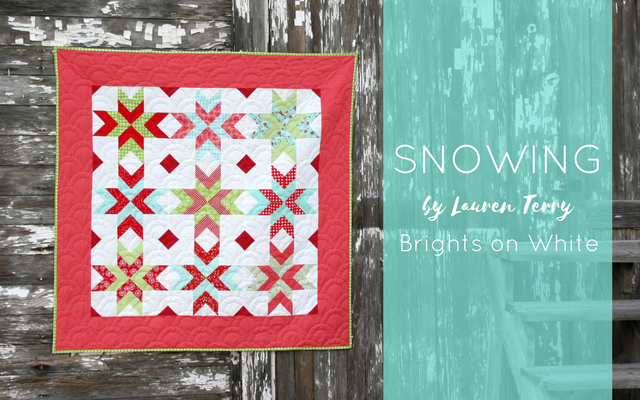 I thought it might also be cute with springy greens, but Christmas fabrics would be perfect! Thank you for a pattern that uses mini-charms. 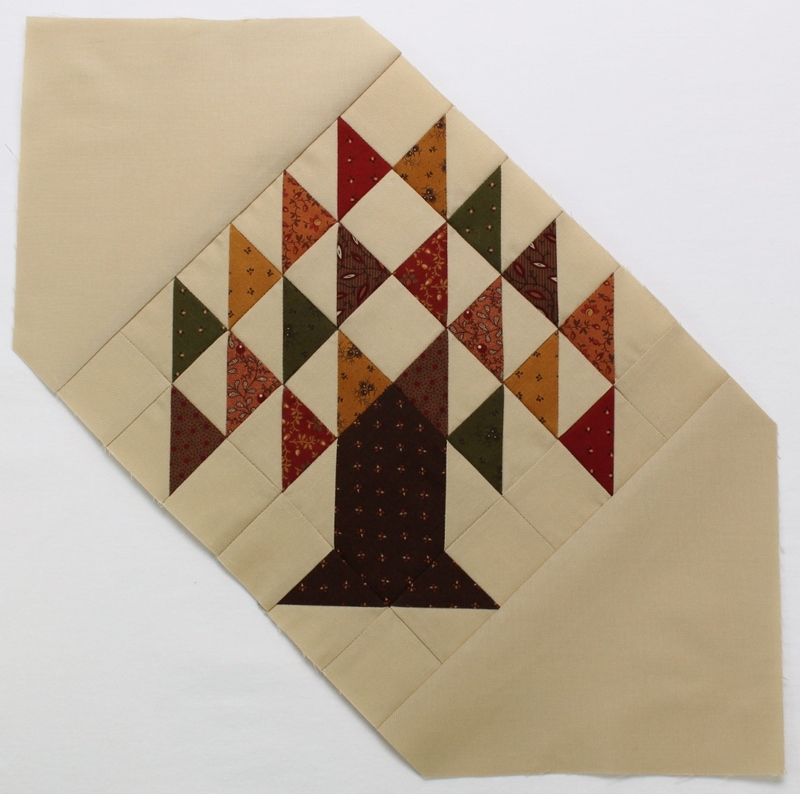 I may make 3 trees and turn it into a table runner. This is a classic design and I’ve always loved it. Have fun making your pillows and bringing the colors of fall into your home!